The Peak Selector is effectively just a comparator. 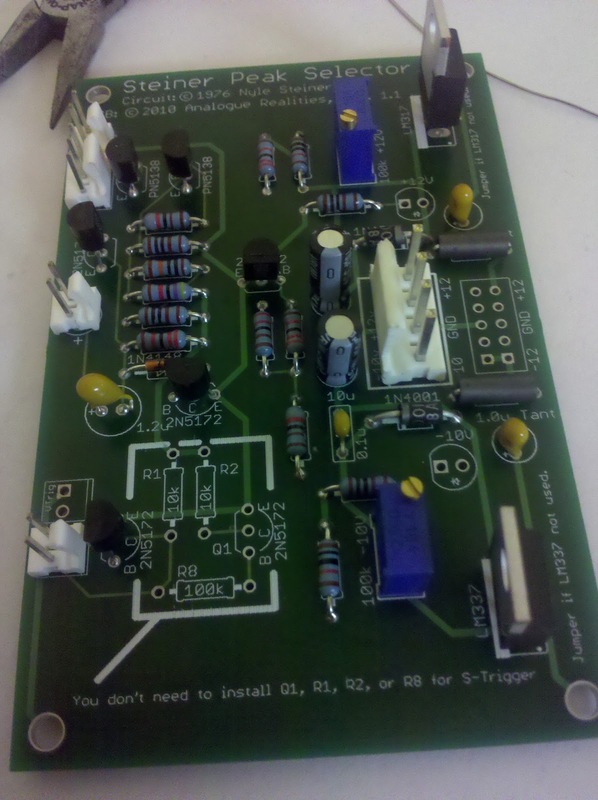 It is a simple interface, with an input, an output, an LED, and a pot to control threshold. It is interesting in that it doesn't use an OpAmp comparator, but is all transistors, caps, and other discrete goodies. I'm still trying to figure out exactly how it works! The output is a trigger (in my case, an S-Trigger). Despite being a relatively simple concept, historically, not a lot of modulars have included comparators as distinct modules. In brief, it will output a high signal (or here, a trigger) while the input signal exceeds a given threshold. It sounds simple, but has a lot of possible uses... creating "digital noise" by feeding it white noise, generating a trigger sequence sync'd to an LFO, starting an event (envelope, sequencer, etc.) when an incoming signal reaches a particular level, etc. It would even act as an (expensive) V-Trig to S-Trig converter! This was a simple board to populate. It calls for a 1.2u electrolytic capacitor, but since those are unavailable, I've used a tantalum. The tantalum caps are slightly more expensive, but since there aren't many needed in the whole system, it isn't a big deal. I've also entirely omitted the circuitry for the V-Trigger outputs (three resistors, a transistor, and the associated MTA header). They're clearly marked on the PCB. If you were to add the circuitry here, you'd get +12V on the S-Trig output while at rest, which probably isn't desirable if you plan to OR various triggers.